Why does Geico ask me not to reveal the limits of my liability coverage in case of a car accident? What to do at the time of an accident: […] Do not reveal the limits of your liability coverage to anyone. Why does Geico ask me not to reveal the limits of my liability coverage in case of a car accident, and should I follow that advice? Negotiation 101, never be the first to say a number. You tell them you have a $300,000 limit and magically they want $300,000. Alternatively, they may just assume you carry the minimum. 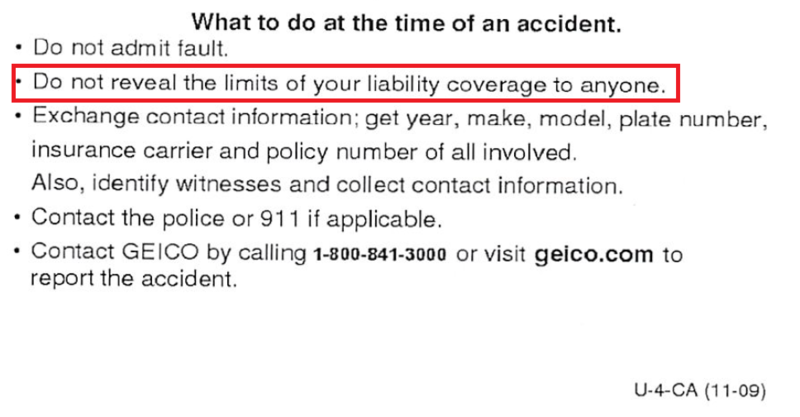 It isn't just GEICO that tells you this, every US car insurance company instructs their customers to not mention the amount of coverage. Your job is not to negotiate. Your job is to collect the specified information and to hand the claim process over to the insurance company. That is also why they tell you not to admit fault. When you start discussing the amount of coverage you have, then you are starting the process that the insurance company doesn't want you involved in. Telling them the maximum that your insurance can pay, or telling them that you only have the state mandated minimum doesn't make the job of the insurance company any easier. The limits of your coverage are completely irrelevant to anything you might do in a situation where your liability coverage is in play. More directly, there is nothing at all for you to gain from providing this information. Another way to look at the question is "why would you want to reveal this information?". There probably isn't much downside to it for you, personally. Your insurer will be on the hook for any negative consequences (like inflated settlement amounts, at the margins), but your policy isn't going to retroactively change or anything. But the insurer will still want to protect its own interests to the maximum possible extent. Your contract almost certainly establishes that every element of the settlement, and negotiations around it, will be handled by your insurer. You blurting out information in this situation wouldn't be much better than you interrupting your own lawyer in the courtroom during arguments in a trial. Someone might see your volunteering that information as an admission of guilt, giving them much better leverage in negotiations than if you'd simply not said anything. The payment sought might become higher due to knowing how much money is "available", as per other answers here. It's not that hard to rack up "valid" medical charges, meaning not obviously fraudulent, like additional MRI scans because the ones already done aren't clear enough (allegedly). This is somewhat risky (the claim may not cover those bills anyways), but it is less risky if the potential insurance payout has a higher ceiling. The other party (or parties) might believe that they are entitled to that amount of money, not for any rational reason but because it's the number they heard, and then becomes hard to deal with within and outside of the insurance process. It might simply make the settlement process longer and more tedious, causing the insurer's money to be burned in extra administrative and bureaucratic costs to no additional benefit to anyone. Consider the case of identifying which medical bills were reasonable and which were opportunistically grasping for more cash-- that audit isn't free. Revealing information about your policy might suggest information about your personal financial situation, making you a target for additional civil litigations (whether they are frivolous or not, you'll have to dedicate time, energy, and money to responding). In my state (in US), once the lawyers get involved, the parties involved are legally required to release insurance coverage info upon formal request. Further, if it goes to trial, the jury is not allowed to know the amount of insurance. If you know how much money is available, you could be more willing to spend it. You might accept an expensive optional test that you would have skipped if you were paying for it. There's no upside to the other party knowing how much insurance you have. It's only going to lead to higher costs. All forms of insurance create perverse incentives to bill for as much as possible instead of competing on price. That's why auto glass repair shops often advertise that they will give you cash back if your insurance covers the repair. They bill so much more than their actual cost that they can afford to give you $100 cash and still turn a profit. This is insurance fraud, but it's so common that apparently authorities don't have the resources to deal with it. Insurance companies want to use coverage limits as a selling point to their own customers, without exposing themselves to this kind of fraud by revealing it to claimants. As another answer notes, coverage limits may end up being revealed in court. But presumably, the claimant would have had to come up with a dollar amount before that. Not the answer you're looking for? Browse other questions tagged united-states car insurance car-insurance liability or ask your own question. Why would a person not want to purchase a Personal Liability (Umbrella) insurance policy? Method for calculating the wisest amount of liability to purchase for car & home insurance? car rental secondary coverage is enough? Why does car insurance also insure for injuries rather than only insuring the car itself?